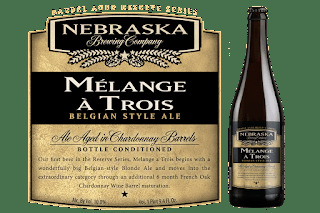 Our first beer produced in the Reserve Series, Melange A` Trois begins with a wonderfully big Strong Belgian-Style Blonde Ale and moves into the extraordinary category through an additional 6 month French Oak Chardonnay Wine Barrel maturation. The essence of Chardonnay permeates while a subtle sweetness remains from the Ale itself. Oak tannins combine to create a fascinating mesh of dry, sweet, and wine-like character. One of our favorites!